We made it to Barcelona! Neither my husband, the kids , nor I has ever been to Barcelona before, and hubby and I haven’t been to Spain in 17 years! We are very excited to start our European vacation here. So much to see and do in a short amount of time! As you would imagine, I am fairly obsessed with what people eat around the world. As much as I love visiting landmarks and museums and churches (I am actually also obsessed with churches), local markets and restaurants are high on my list of places to experience. I am fairly open-minded when it comes to trying new foods, although I am not a huge fan of meat, game and pork. I know, my options will be limited in Barcelona since every other menu item contains some sort of the above mentioned. Moderation is my mantra. I am for sure on the lookout for excellent paella, which is basically like the national rice dish of Spain. I L-O-V-E rice in any way, shape or form. 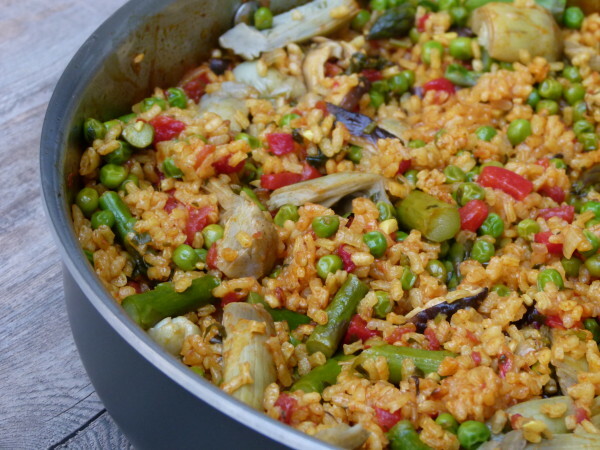 Paella is particularly delicious because it is typically cooked with lots of seafood, chicken, pork and some other tidbits like olives and roasted peppers all mixed together in the same saffron-infused dish. It’s so tasty. And it’s basically Mr. Picky’s nightmare since he would eat all of those things PLAIN, and “why did they have to mess this up by cooking it all together? !” I already gave Mr. Picky a pep talk before we left about being open-minded about food, otherwise he might ended up starving, or worse, really cranky. I’ll keep you posted, friends. Wish me luck. Whether I find the perfect paella in Barcelona or not (and if you know where I should go, speak up! 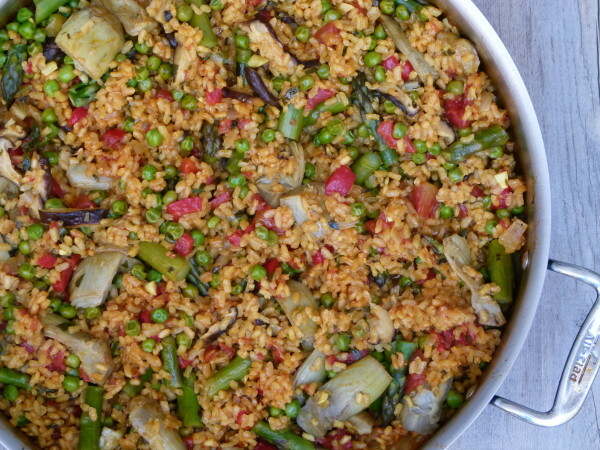 ), I did teach this Vegetable Paella in my cooking classes this past spring. And I might admit, it was so flavorful and rich even without all the meat. You don’t normally find paella loaded with vegetables, and I find that true about a lot of the dishes in Spain – not very veggie-heavy, unless you count (fried) potatoes as a veg. Asparagus, peppers, artichokes (by all means, use frozen), tomatoes, mushrooms all go in here. I did make this several times for my vegetarian students with veggie stock, and it was very good, but I do prefer using chicken stock. 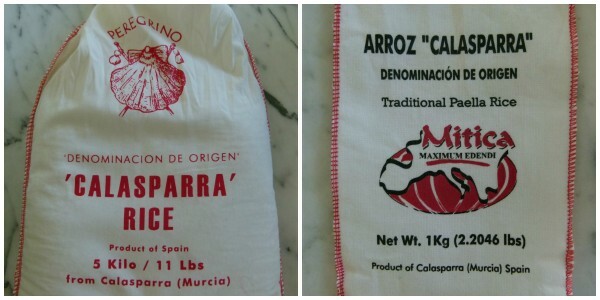 The one ingredient that is missing from this paella recipe that makes it an imposter and non-authentic is saffron, which gives the rice a beautiful gold color and imparts a unique flavor. Saffron is absurdly expensive and I have always had success substituting a bit of ground turmeric for saffron when I need that great yellow tint. If you have saffron however, by all means use it by crumbling it and dissolving it in some hot stock. I love eating this paella with a green salad on the side and that’s it (although a pitcher of sangria wouldn’t hurt.) More from Barcleona to come, including my quest for the best paella! In a large skillet pan (between 12-14 inches,) heat the oil over medium-low heat. Add the onion and cook, stirring occasionally, until translucent, about 5 minutes. 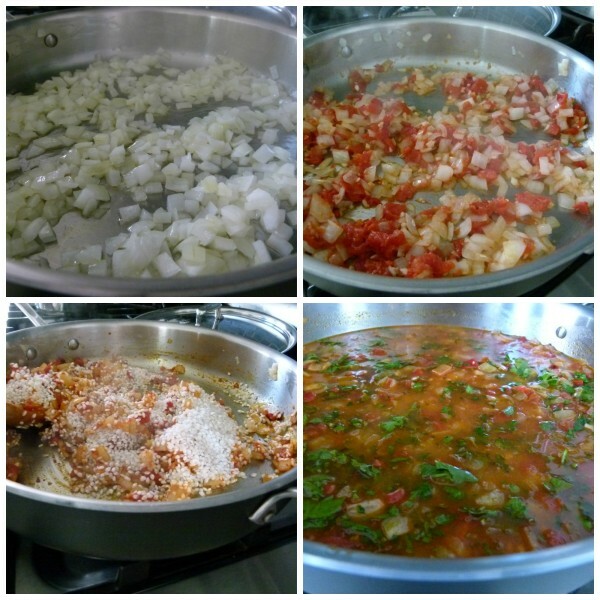 Add the pimientos, tomato and garlic and cook, stirring occasionally for 2 minutes. Stir in the salt, both paprikas, turmeric, and rice. Add the chicken stock and parsley and bring to a boil. Continue cooking over moderate heat, stirring occasionally, until most of the liquid has been absorbed by the rice, about 7 minutes. 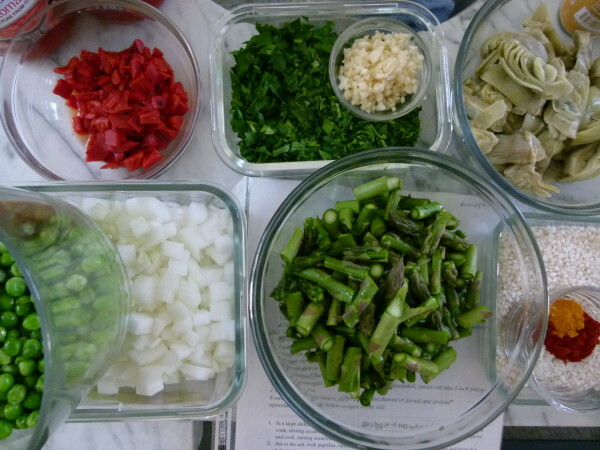 Stir in the asparagus, peas, and artichokes. Reduce the heat and simmer, covered, for 15 minutes. Remove from the heat and let stand, covered for 10 minutes before serving. Serve with lemon wedges, if desired. *to give the artichokes some extra flavor, pat them dry and sauté them in olive oil and season with salt and pepper. you can also add mushrooms to the paella to add a meatiness. Sauté with onion in Step 1. Delicious and easy to make. Thank you Pamela! Yes, you are right and I never get socarrat. I fully understand this is not a traditional paella and it will never win a paella contest, but it’s still quite delicious! Love to hear that and thanks for letting me know your adaptations! I actually happen to have saffron so how much would you recommend using in replacement for the turmeric? Thanks! You just need a good pinch of it, but it must be dissolved in hot liquid before adding. Heat up the broth and dissolve it in that. You can use any kind of olive oil you have. Arborio rice is for risotto and is very starchy. I really don’t know if it would work here. Maybe you should try to rinse it first to remove some of the starch. I found “bomba” rice on Amazon…excellent. Sorry about that — serves 6! Hmmmm, hopefully you used white rice and not brown. Did you use the same size pan? If it’s too big it could cause the water to evaporate too quickly and then there won’t be enough to cook the rice. Lastly, if the heat was too high, that could also cause the water to evaporate too quickly. Let me know if any of this makes sense! I used the white rice….and if anything the pan was too full…i almost doubled it. i’ll try it again today and let you know! Not sure what I did wrong here… I did everything per the recipe. I’m using Organic Brown Jasmine rice… it is not even remotely cooked at this point, but the liquid is basically gone. I looked at the package and your liquid to rice ratio was within the range, but it just isn’t working out. Any way for me to salvage it? I’m not sure whether it is worth it to add more liquid at this point. Thanks! It smells fantastic! Hi Natasha, Sorry to hear that this is not going according to how you thought, but we can salvage it. This recipe calls for white rice, not brown. Check the images to see exactly the kind of rice you want to use here. Brown rice takes 3 times as long. Does it need more liquid or is it all dry down to the bottom of the pan? If there’s still some moisture, cover it all tightly and let it cook until tender and DO NOT STIR. You don’t want this getting sticky. Brown rice takes a total of about 50 minutes, so you’ll have to do some calculations to see how much longer you’ll need. Thank you! I ended up adding a cup of stock, but it didn’t really absorb at all. In the end we ate it and it was still a hit. Haha. The rice just had a little crunch. My 3-year-old even said, “Oh, mom, this rice is fine. It tastes GOOD!” haha. Next time I’ll be more attentive to the type of rice and I’ll definitely be doubling it! Made this last night and my Mr. Picky ate it for dinner last night, a snack this afternoon and leftovers with dinner tonight (cause he wouldn’t eat the other things I made! 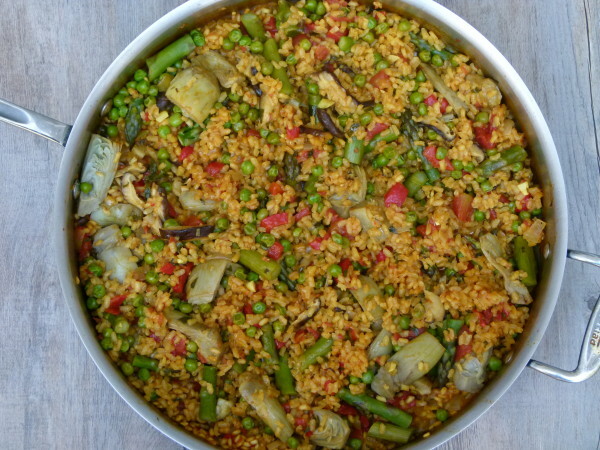 )….I added the mushrooms and got him to eat all of the veggies in the paella without picking anything out! A success for sure. If i did want to add shrimp or some other meat to it – could I? Great! Yes, you can add meat or shrimp. For chicken or sausages, brown them first, remove from pan and then sauté veggies. Put meat back in when you add rice. For shrimp, add raw shrimp 5 minutes before rice is finished and cook through. Wow! What a delicious dish! My picky kids and husband ate this. Thank you so much! I added at the end a tablespoon of lemon juice. Soo good! Hi, Pamela. This recipe looks great, and my newly-declared vegetation 10 year old has requested that I make it for her. Can you suggest a substitute for asparagus in this dish? I haven’t seen any really nice looking asparagus lately. Thanks in advance! Hi Mary, Asparagus isn’t season right now, so you’re better off with green beans. They’re looking good and I think they would be perfect in the paella! Please let me know if your daughter approves! Thanks so much. I’ll definitely let you know how it turns out. For what it’s worth, she loves your Mexican Chopped Salad and Vegetarian Antipasto Chopped Salad (among other things). 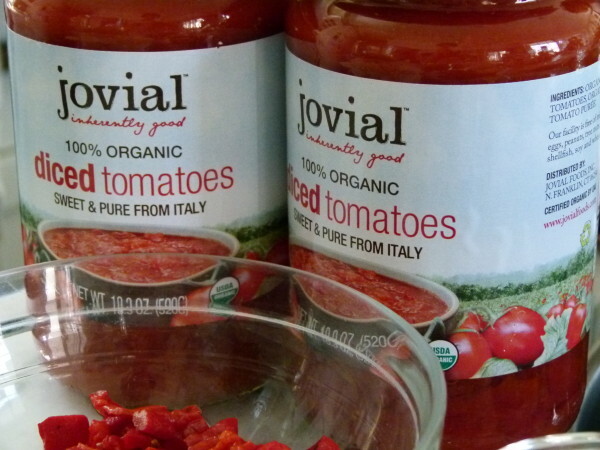 We’re having great fun looking for and trying new veggie-friendly recipes on your site! Just made this, and it was a hit! Will definitely be making this one again. Thanks for another great recipe! Phew! So glad to hear that. Thank you for letting me know! Trying this tonight for our family with a vegetarian daughter home this weekend and a mostly vegetarian rest of the family . . . Can’t wait! I had two great friends over for dinner. One doesn’t eat fish. The other is a gluten and dairy free vegetarian. Your Paella saved the day! A huge success. Thank you! That’s a dinner party challenge and looks like you nailed it! So glad you enjoyed it! This veggie paella was so delicious in class!